In the previous blog post, the First Steps of a Reman Process, we focused on the wash and magnaflux testing in our remanufactured engines. The wash and inspections set the foundation for successfully building a remanufactured engine. This critical initial stage ensures that engine components are free of any grime and dirt, and is functionally sound. Now we’ll focus on the remaining three steps of the process that we complete at our state-of-the-art facility in Ridgefield, Washington. The natural wear and tear on an engine require us to replace the most used components. We’ve found that, generally, it takes one-and-a-half engine cores to build a single remanufactured engine. In this stage, we’re identifying which parts need to be replaced. The blocks, heads, crankshafts and other large components are taken to the machine shop where our technicians make any needed repairs. This is the point when our prep specialists take over. They will catalog which parts need to be replaced and prepare the replacement orders. They will also verify the machined parts are the correct ones for a rebuild. Once the replacement orders have been filled, they will gather all the engine parts and organize the components in three, tiered carts and stage the carts in the reassembly area . The engine builders are given the inventory list and components and begin their job of rebuilding the engine. The final technical step in the engine rebuild process is the dyno test. 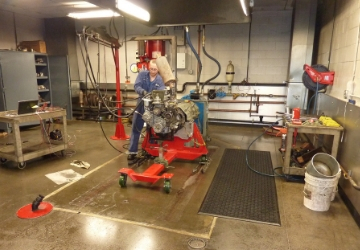 Techs perform this critical test by connecting the remanufactured engine to the dyno machine. The engine is started and during the 60-minute run time is put through a battery of tests to make sure it’s performing to our exacting standards. “We want to make sure the engine is going to perform as it’s expected to once it’s out in the field,” Crace said. Once the engine passes dyno testing, it’s taken to our paint booth where it receives a primer coat and then paint. After the paint has dried, the engine is bagged, tagged and prepared for shipment. The unit might also go into storage for a later shipment.